The Adult Bible Study course unfolds one book of Scripture, Old or New Testament, each year. We do this through the sharing in dialogue and conversational exchange of how each and every participant is touched in diverse and varied ways by the bi-weekly assigned readings. We review each lesson's questions as an aid to help reveal the Word to each individual. The Adult Bible Study meets bi-weekly on both Saturday mornings (10 AM - 11:30 AM) and Monday evenings (7 PM - 8:30 PM), except at Thanksgiving, Christmas/New Year’s and Easter. Click here for scheduled meetings. Please join us at any time that is convenient to your schedule. Questions or for more information, please call Janice at (213) 308-9481.
conventional emblems placed around the figure of St. John. (The right hand extended in a gesture implies that the character was speaking.) 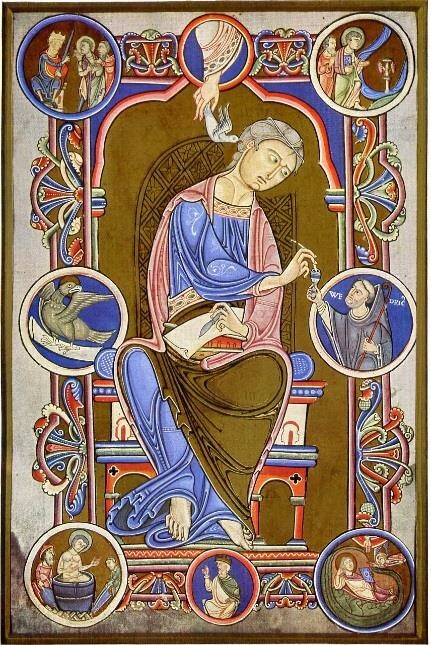 The donor of the manuscript, Abbot Wedricus, is supplying the ink for the figure of St. John. The hand of God holds the dove, the traditional symbol for the Holy Spirit that serves as St. John 's inspiration who is speaking into his ear the divine word. The eagle is the identifying symbol of St. John himself. The other circular pictorials show scenes from St. John's life (Janson, 296). Click here for recent Bible Study survey results. Bible Study meets in our Parish Center located at the corner of Roxbury Dr. and Santa Monica Blvd.